BRO. ADALBERTO SANTIAGO-VOLUNTEER NATIONAL COORDINATOR OF PUERTO RICO SINCE YEAR 2001…..
(1). 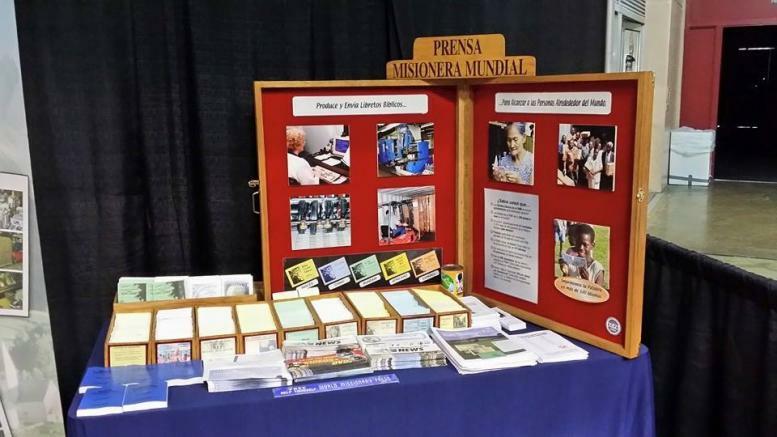 World Missionary Press has printed Scriptures in 341 languages. To print in 300 languages was a goal God gave co-founder Watson Goodman at the beginning of the work 53 years ago. The 300th language-Hmong Daw for Vietnam, Laos, and Thailand-was produced in January 2000. No. 308 was Dari for Afghanistan. (3). WMP does not sell any materials. Everything is given away free. Literature has been distributed in 211 nations and territories and islands of the world. (4). WMP sent this year (20) 20-foot and (19) 40-foot ship containers (year ending September 30, 2013). Every container saves WMP thousands of dollars over what the post office would charge for the same amount. We have now 80+ volunteer national coordinators in 73 nations. (5). More than 36,000 distributors worldwide request/share WMP Scripture booklets. (6). WMP receives about 1,000 foreign letters every month asking for literature. (7). One wide roll of paper, 12 miles long, prints the equivalentof 85,000 Scripture booklets and costs an average of $1,080.00 U.S.
(8). Last fiscal year (ending September 2013) WMP produced and sent 121,015 boxes a total of 49,252,434 Scripture booklets, Bible studies, New Testaments, and salvation coloring books. (9). During a three-month period, 700 volunteers from 130 churches donate their time to WMP to work on the bindery, New Testament production, or mailing. (10). In February 2001, WMP produced its one billionth Scripture booklet. Since then, an addition 839 million booklets have been produced. A contibution of $50 will reach 1,000 with the Gospel; $100 will touch 2,000 lives; and $500 will present 10,000 precious readers with the message of God’s love and forgiveness. A gift of $1,080 will provide a roll of paper that provides the insides of 80,000 Scripture booklets. E-mail: mailroom@wmpress.org / Web: www.wmpress.org. TO PROVIDE AND SHARE THE GOSPEL PRINTED PAGE THROUGH DIVERSE AGENCIES IN THE BODY OF CHRIST FOR MISSIONARY OUTREACH, INTERSESSION FOR THE PERSECUTED CHURCH WORLD WIDE, ECT.